Today is a high point in our exploration for Nominet Trust of how to use digital technology in later life, with a workshop at the RSA. We’ll be reporting on Twitter with the tag #dtlater, so here’s some background and our plan for the day, designed by my colleague Drew Mackie. 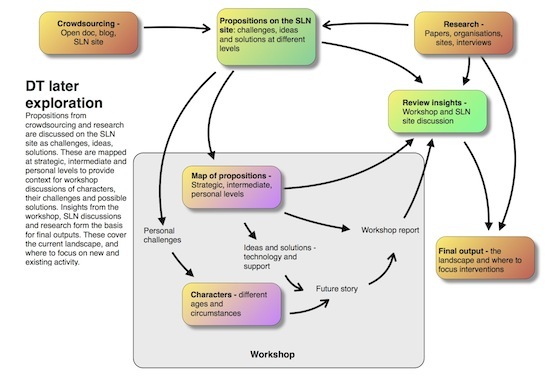 We have run an open process to gather a set of propositions, which are a mixture of challenges, ideas and solutions. We’ve been discussing those at the excellent online space provided for us by Dave Briggs – do join us here. 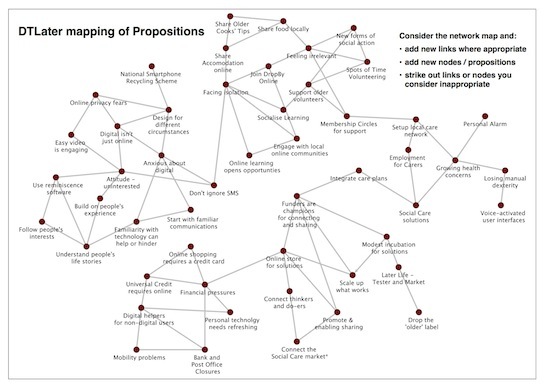 Today we’ll discuss a map of the propositions as a trigger for discussion, and then invent some fictional characters facing life challenges that might be aided by technology. We’ll be relying on the creativity of our workshop participants to draw on the solutions in our propositions – and their own expertise – to create some positive future life stories for our characters. From discussion, we’ll be looking for some strong themes to explore further online, before writing our report at the end of November. There’s a full set of references in our online space. David Wilcox on We know lots about innovation, digital tech, social care and later life. Now who will make it useful? Peter Farrell on We know lots about innovation, digital tech, social care and later life. Now who will make it useful? Eric Harris on We know lots about innovation, digital tech, social care and later life. Now who will make it useful?